Bring your computer literacy course back to the BASICS. COMPUTER LITERACY BASICS: A COMPREHENSIVE GUIDE TO IC3 provides an introduction to computer concepts and skills, which maps to the newest Computing Core Certification (IC3) standards. Designed with new learners in mind, this... read full description below. Bring your computer literacy course back to the BASICS. 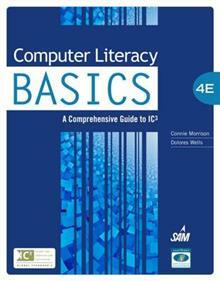 COMPUTER LITERACY BASICS: A COMPREHENSIVE GUIDE TO IC3 provides an introduction to computer concepts and skills, which maps to the newest Computing Core Certification (IC3) standards. Designed with new learners in mind, this text covers Computing Fundamentals, Key Applications, and Living Online - everything students need to pass the IC3 exam, and finish the course as confident computer users. MODULE 1: COMPUTING FUNDAMENTALS. Lesson 1: Computers and Computer Systems. Lesson 2: Input, Output and Processing. Lesson 3: Computer Protection. Lesson 4: Computer Maintenance. Lesson 5: Computer-Related Issues. Lesson 6: Software and Hardware Interaction. Lesson 7: Software Fundamentals. Lesson 8: Operating Systems. Lesson 9: Windows Management. Lesson 10: Operating System Customization. Module 1 Review. MODULE 2: KEY APPLICATIONS. Lesson 11: Exploring Microsoft Office 2010. Lesson 12: Getting Started with Word Essentials. Lesson 13: Editing and Formatting Documents. Lesson 14: Sharing Documents. Lesson 15: Working with Tables. Lesson 16: Using Templates, Styles, and Building Blocks. Lesson 17: Enhancing Documents. Lesson 18: Getting Started with Excel Essentials. Lesson 19: Organizing and Enhancing Worksheets. Lesson 20: Creating Formulas and Charting Data. Lesson 21: Getting Started with PowerPoint Essentials. Lesson 22: Enhancing Presentations with Multimedia Effects. Lesson 23: Getting Started with Access Essentials. Lesson 24: Managing and Reporting Database Information. Module 2 Review. MODULE 3: LIVING ONLINE. Lesson 25: Networks Fundamentals. Lesson 26: Communication Services. Lesson 27: Communications and Collaboration. Lesson 28: Using the Internet and the World Wide Web. Lesson 29: Web Content. Lesson 30: Technology and Society. Lesson 31: Security, Privacy, and Ethics Online. Module 3 Review. Appendix (IC3 Grid). Glossary. Index. Connie Morrison has over 30 years of combined experience in education and educational publishing. She has taught students at all grade levels from elementary through college, and she has trained employees in industry. Connie currently works as an education consultant for Encore Training, Inc., providing staff development and training for educators. Dr. Dolores J. Wells has taught business and computer science at Hillsborough Community College in Tampa for 29 years. She teaches a variety of distance learning courses, participates on several committees assisting with the creation of new AS degrees for Florida community colleges, and has created numerous e-packs and authored or contributed to several textbooks, including Discovering Computers. More recently, she has authored three editions of Shelly Cashman Series' Dreamweaver books. Dr. Wells also created the first WebCT e-packs for the Shelly Cashman Series.